In this season of giving, there is truly a gift that keep on giving: suffering. It’s a gift that nobody wants, but that everybody receives at some point in their life. Jesus Himself didn’t have a suffering-free existence: “My soul is overwhelmed with sorrow, even till the point of death” (Matt 26:38). And He told us point blank that we, too, will have trouble in this world (John 16:33). Are you weighed down by suffering? Suffering can come in many different ways, and oftentimes we can never fully perceive the weight of suffering someone else is carrying. However, our Savior knows what it’s like to bear the weight of suffering. He voluntarily took the pain for us; in doing so, he gave us healing, too: “and He Himself bore our sins in His body on the cross, so that we might die to sin and live to righteousness; for by His wounds you were healed” (1 Pet 2:24). 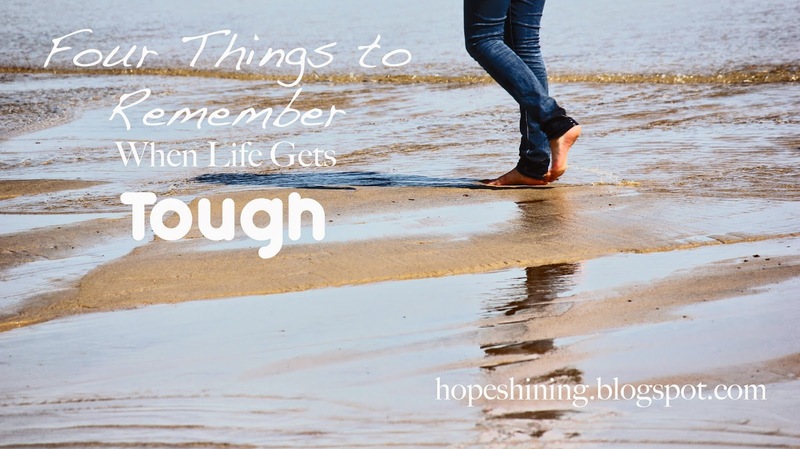 With that in mind, here's four things to remember when life gets tough. The Word of God word gives us a counter-cultural perspective on suffering and shows us how we should deal with trouble. Our culture thrives on messages of what we need to do to finally “make it” – to have a complete life, complete happiness, or complete joy – which is always right around the corner. But the Bible has a polar opposite message: it’s in suffering that we are working hard towards completeness. Maybe what we should focus on is not the suffering we’re experiencing but what the suffering is doing in us – making us mature, complete, and not lacking in anything as James tells us. Next time suffering is getting you down, stop and remember the end goal: this suffering needs to work its course so that you may be continually maturing. Usually, the greater the suffering, the greater our negative attitudes can get. Here again, the Bible is counter-cultural. James tells us of the attitude that we should have when the going gets rough: joy – and not only just joy – but pure joy. Why should we have this joy? It's because our faith is being grown and tested through suffering; perseverance is displayed only when we have trouble to persevere through; maturity is being formed in us. Though we may not be happy with the pain we’re experiencing, we can be joyful in what it’s producing in us. Ultimately, though, we have joy centered in something greater than ourselves: We’ve been granted access to God; we can delight in our savior when nothing else seems delightful (Isaiah 61:10). We have this hope as an anchor for the soul, firm and secure (Hebrews 6:19a). Life may look pretty bleak during suffering. How can there be any hope? The author of Hebrews tells us what can be our anchor when life is a storm of suffering: our hope in the grace from Jesus. We can cling to this hope that will not change: in the end (eternally speaking), it’s all going to be okay because our destiny rests with the Lord and Jesus’ saving grace. If He has our eternity covered, then we can be sure He is also walking with us in the meantime. What tool can we use when suffering is getting us down? Peter stresses the importance of preparing our minds. Suffering is going to come and temptation to doubt God or to fall in to sin will likely come with it. We are not left unequipped, however, and should prepare our minds with God’s promises: He’s our strong tower (Prov 18:10); He’s going to supply our needs (Phil 4:19); He’s grace is sufficient in all our weakness (2 Cor 12:19). Truth has power. Equipped with God’s promises, we can extinguish the flaming darts of the enemy and praise Jesus during it. You get to choose your attitude; why not choose joy because we have Jesus no matter how bleak things look? You’re anchored: hope in Jesus keeps you grounded even when you feel that you’re drowning in a sea of suffering. You can get equipped: prepare your mind by taking up God’s promises so that you can praise God even when it’s hard. Beautiful post! Thank you so much for this :) Such a great reminder! Hey Britt! Yes, this is definitely a reminder I need myself sometimes :) Thank you so much for commenting! Same here! The lord knows his own! He uses suffering to make us more like HIM! Amen! It is such a strengthening reminder when we realize that what we are going through is truly making us more like the Son. Thank you for commenting!